You have probably heard a lot about the colors of the year by now - but I wanted to join in and show a few more picks in these colors. 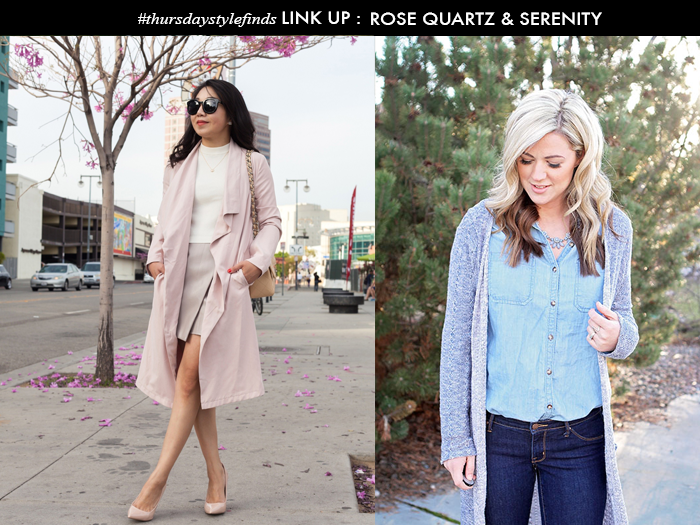 Rose quartz and Serenity are the perfect colors for spring. CAN YOU GUESS WHICH BLOGGER WORE WHICH SHOES? Shoes are one of my favorite things to shop for. This week I am starting something new. 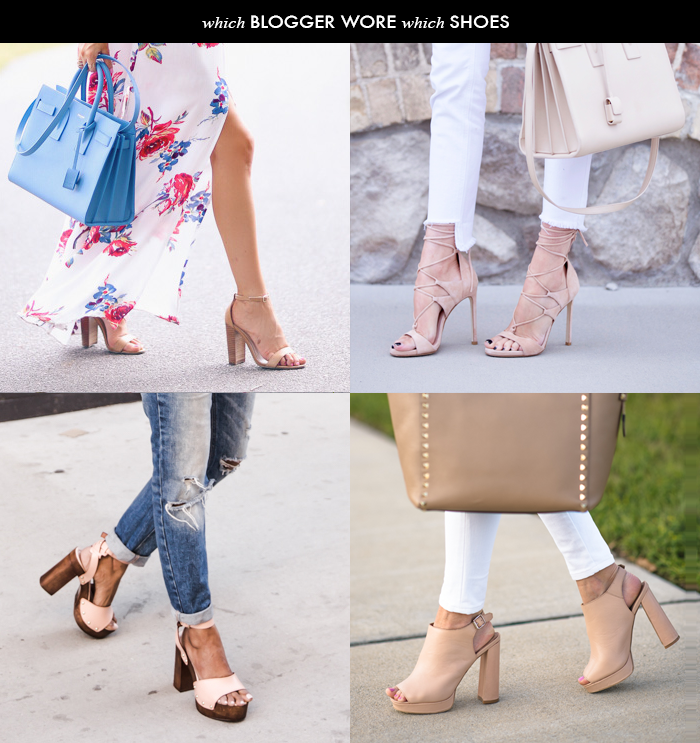 Each Thursday, I will feature four bloggers' shoes, but I will not name which blogger wore which shoes. You will have to check back on Friday when I reveal which bloggers shoes were featured. Leave a comment as to which blogger you think they are. In keeping with the theme of the colors of the year - I have picked two bloggers wearing both colors. What a fun game! i want all the shoes that all those bloggers wore and I don't recognize any of them. I need to start following more fashion bloggers! Gorgeous! Love everything in these colors! How fun! I don't recognize anyone either, but am coming back on Friday to find out who they are! But that floral skirt in the first picture, so, so cute! and I love the rose quartz bag, NEED! These colors are so pretty + light- great for Easter! I saw those pink mules in a magazine and have been so close to ordering them. Obsessed! This is such a lovely set featuring this year's it colors! I am swooning over those Kate Spade marble accented sandals, they're gorgeous! I also love this game, so interactive and fun, such a great idea! Thanks so much for sharing, girlie, and I hope you're having a great day so far! I have to tell you, I haven't been overly excited about Pantone's color choices for this season, however, these choices are making me reconsider. Really nice picks and I am loving the shoe game! Thanks for hosting, Lisa. I am so glad these colors are on trend, I love them! That scalloped edge wallet is the cutest! This is such a cute post idea and I absolutely love this years colors! That rose quartz dress is calling my name! All of the shoes are gorgeous & how pretty are those colours!! I'm dying over #10. Have a Happy Easter Lisa! What a fun game! I'm swooning over those Jeffrey Campbell mules! I am in love with these two colors! That blue crossbody bag is amazing! 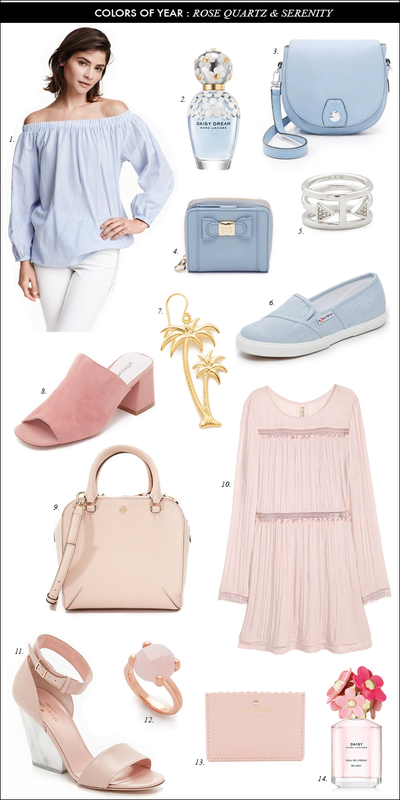 Thanks for the feature, I love the rose quartz color and I'm dying over the Kate Spade shoes you picked. Oh I love literally all of these shoes! What a stunning color! love it! Thanks for sharing my blog photo!! Wouldn't it be fun to be the person who comes up with the names for each season's big hit colors? Not pink and blue or even pale pink and baby blue but rose quartz and serenity. Divine. I would have guessed all of those great shoes were yours! !